In my recent post about the relationship between between food and emotion, I was a bit skeptical about whether food expresses emotion. This is in part because I was skeptical about whether works of art express emotions at all. Although emotions are often represented in a work of art via its association with a narrative or depictions of emotional behavior, the work doesn’t necessarily cause that emotion in us. Sad songs don’t make us sad; figures in paintings exhibit anger without making us angry. We obviously have feeling responses to art, but the mechanisms of that response are obscure. No doubt food can trigger emotions in us as well. But, with the exception of revulsion, it seems to do so indirectly. An apple pie can cause you to remember your mother and that may trigger emotional responses to the memory. But the emotion is not directed at the food; it’s directed at your mother. The food is just triggering the memory. Without those memories of mom, the apple pie is just a tasty dessert with no emotional overtones.This is because food, in most contexts, is not the sort of thing about which we feel anger, fear, sadness, or love. This has led many philosophers to claim that food lacks the emotional punch that genuine fine arts have. But I’ve been thinking about this issue a bit more, and this skeptical answer does presuppose certain assumptions about memory that may not be warranted. Research into how memory works is still young and incomplete. But there is substantial evidence that our memories are unreliable and in fact are shaped by present events. They are mental reconstructions, nifty multimedia collages of how things were, that are shaped by how things are now. Autobiographical memories are stitched together as and when they are needed from information stored in many different neural systems. That makes them curiously susceptible to distortion, and often not nearly as reliable as we would like. We assume that human memory functions like a computer’s memory, precisely encoding information that can be accurately recalled later. But this idea was abandoned long ago by cognitive psychologists. Memory, it seems, is closer to imagination than is commonly believed. The great pioneer of memory research, Daniel Schacter, has argued that, even when it is failing, memory is doing exactly the thing it is supposed to do. And that purpose is as much about looking into the future as it is about looking into the past. There is only a limited evolutionary advantage in being able to reminisce about what happened to you, but there is a huge payoff in being able to use that information to work out what is going to happen next. Similar neural systems seem to underpin past-related and future-related thinking. Memory is endlessly creative, and at one level it functions just as imagination does. But if this is the case, sensory experience, including taste experience, can actively shape memories and our emotional response to memories. Your memory of mom’s apple pie may be influenced as much by the apple pie in front of you and the impact of its particular flavors than by an actual memory from childhood. To the degree the experience triggers an emotional response, it is a response to an imagined version of your mom’s apple pie that relies on present experience. Thus, the emotion may be “about the food” as much as it is “about your mother”. Achatz showed off a dish he’ll be offering at the restaurant, a play on roasted marshmallows featuring sweet potatoes cooked in blue corn for a blackish, log-type hue, that are then sprinkled with flavored alcoholic tapioca maltodextrin and served to the table flaming. It’s served alongside another dish with housemade marshmallows. It’s meant to evoke powerful memories of the past, something Achatz emphasized as an important element of the dining experience. Although the dish evokes memories of toasted marshmallows from childhood, part of the emotional response will surely be directed at the stunning presentation and juxtapositions of flavors in the dish itself. 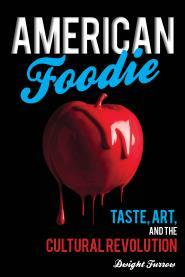 The flavors are not merely an incidental trigger of an emotional response but play a role in amplifying it. This issue of the relationship between food and emotion is part of the larger question about the relationship between emotion and the arts in general. Is there a particular feeling that typically characterizes a genuine engagement with a work of art? I think there is. In its most extreme manifestation we might call it “awe”. But more typically it is a sense of wonder or mystery. At the very least, works of art intrigue us. All of these—awe, wonder, intrigue—are emotional states. They are directed toward an object and have a distinct phenomenology characteristic of emotions—there is something that it is like to be in a state of wonder or intrigue. Philosophers will have to revise their view that food does not express emotions.